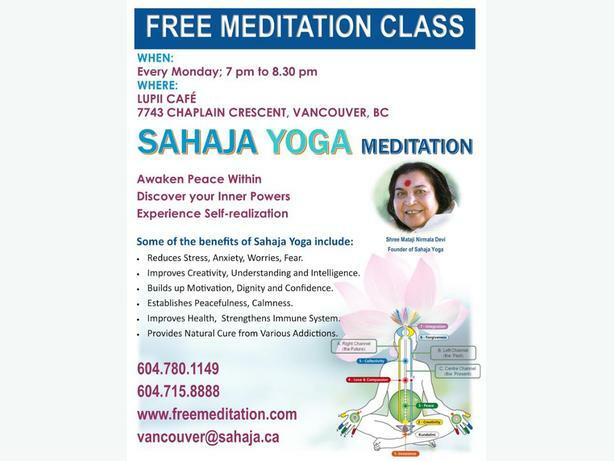  Log In needed Free Sahaja Yoga Meditation Classes in Vancouver B.C. Classes are always free, open to anyone and everyone who has an interest in meditation - young and old, beginners and seasoned pros. The purpose of the classes is to provide instruction on simple meditation techniques to anyone who wishes to learn and to come together to enjoy meditation as a group. It helps reduce stress, increase wellness and maintain balance. Experience universal connection and joy! In each of our free weekly classes, we perform guided meditation led by one of our many experienced volunteers, Watch videos that relate to our experience and learn about our inner subtle system consisting of channels and chakras which govern our well-being on all levels - physically, emotionally, mentally and spiritually. Discover how to awaken your own inner spiritual energy called Kundalini and heal yourself from within. Perform Chakra cleansing techniques, including Chakra workshop. Experience through meditation how we can improve our overall well-being and become a more balanced personality. Learn how to apply simple and practical techniques that bring meditation into your daily collective experience. This is Sahaja Yoga Meditation, a practice based on the pure teachings of Shri Mataji Nirmala Devi. This practice is based on initial Self-Realization via Kundalini awakening followed by deep spiritual growth assisted by this energy. This style of meditation is an actualization of connection verified by sensory experience. You don't need to bring anything to the classes just wear clothing that is comfortable. As always, newcomers are always welcome so please feel free to bring along family or friends. Looking forward to seeing you there!